Visitors and commuters can take advantage of a new car park in Beeston, after it opened recently. The new car park at Technology Drive is adjacent to Beeston Train Station so is ideal for commuters and visitors a like. 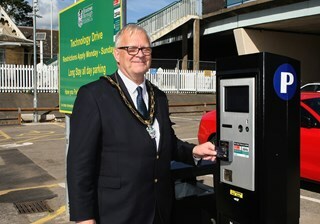 Leader of Broxtowe Borough Council, Councillor Richard Jackson said “This is a fantastic new facility which triples the number of public car parking spaces available at Beeston Train Station. The new site will enable more people to make use of the excellent transport links in Beeston, as well as enjoy the some of the great local businesses in the town. Easy access for wheelchair users to platform 2 is good but when the wheelchair user returns they will have the problem of making it back to their car from platform 1. Have there been any surveys as to how many wheelchair users actually commute via Beeston station? For example TfL accept that resources are finite, and thus many Underground stations have no facilities for the disabled. No surprises here then! The right wing continue to attack and undervalue the disabled.- a human being who can walk and talk is no different from a human being who requires a wheelchair to get around, or does AUSTERITY BRITAIN continue to punish the disabled? If both Platforms offer good disabled access them more disabled people will be willing to use the station. Doing a survey now before full disabled access is available then there will not be many disabled users of the station. It is a case of chicken and the egg. It isn’t that straightforward. There is a limited amount of finance. If it is spent on disabled access at Beeston station, it won’t be spent elsewhere. Therefore it is essential that it is used for maximum benefit. If there is no need for wheelchair access at the station, the money will have been wasted. It’s a simple POLITICAL decision. One person is equal to another, and your attempt at explanation merely highlights your disdain for basic equality. In a hugely rich country like ours there’s always the money to do what is correct for all the people who live here. The left get the country into such a financial mess when in power. Throw money at anything and everything without any thought about need. Remember that governments and councils don’t have any money of their own. They merely distribute our taxes. It is their responsibility to ensure it is spent wisely, and ours to question expenditure. Only in the mind of the left is there a Magic Money Tree. Indeed it is straightforward Howard. There is no way a person in a wheelchair can easily, and safely, get from the booking hall to Platform 2 other than by over the road bridge. Apart from that, where do you think the money for the improvements should be spent? I agree that there is a limited amount of money available. However if if we do not invest in better services for all our citizens then we cannot expect all our citizens to work to produce more wealth. It is a ‘ONE NATION’ idea that should be seriously considered. Years ago my employers had to create better and suitable access for disabled people to all our branches. That meant creating ramps instead of steps. Before these ramps were created I often went outside the branch to discuss and help disabled customers do their banking in the street. This of course was and is now unacceptable in a modern society. So why have a Nationalised British Rail, as it was at the same time as the alterations that my bank employers had to make, got away with not giving the same type of disabled access. The Rail Network is still Nationalised. The train operators do not own the station buildings. If we fly from Heathrow Airport disabled access into the planes is there so why not at all Railway Stations.